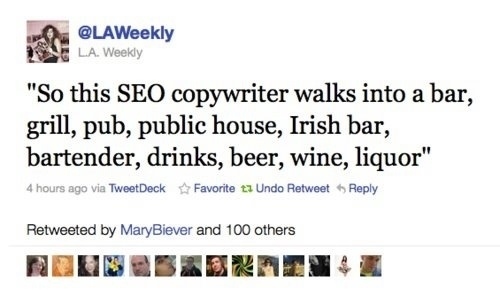 SEO Copywriter Walks Into A Bar Meme is even better since I have worked on numerous tools for SEO. I think this tweet sums up common SEO in its entirety. It is amazing how many peoples sites I see that are just stuffed keywords and jammed as tight as you can see. Pretty funny! Learn SEO!